Being mostly screen free as a family means that games are really important to us. We play a lot of board games starting at a young age. They are the perfect way to connect with our kids and replace "movie night." Nora is finally getting to the age where games can be really fun. They involve a little strategy, cooperation, and a little more thinking. Recently, I asked Nora to pick her favorite games out of all the games we owned. And, here's a look at what she said. To be honest, I couldn't agree with her more. These are all fantastic choices! Tiny Polka Dot - A fantastic set of math/card games. 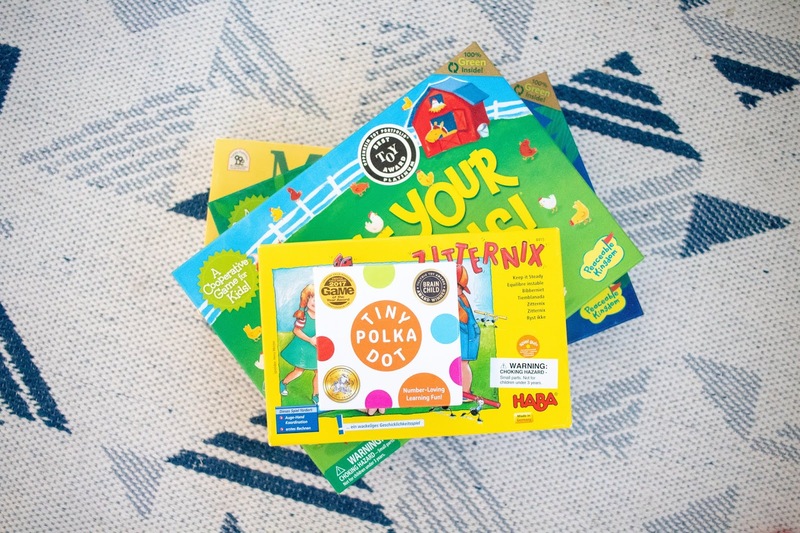 The box includes games from about age 3 to ages 7/8 in a fun card game style. Some cooperative games, some win-lose. Zitternix - This game is a great fine motor challenge, along with one of the only "win-lose" non-cooperative games she likes. This is a game that Gus and Henry (7) both enjoy too. Count Your Chickens - A cooperative game, again focusing on counting. Hoot Owl Hoot - A cooperative game, focused on colors, but some strategy depending on the number of owls you play at once. Max - A cooperative game, this one takes a lot more strategy. There is a bit of luck involved here too, while you try to keep a neighborhood cat from eating some local wildlife. This one is the most challenging of the games she loves. Henry will also play this one. As you can see Nora loves math (not shocking the sensitive period for math starts around age 4) and working together in a social way. We play most of these at least a couple of times a week! Does your family love games? 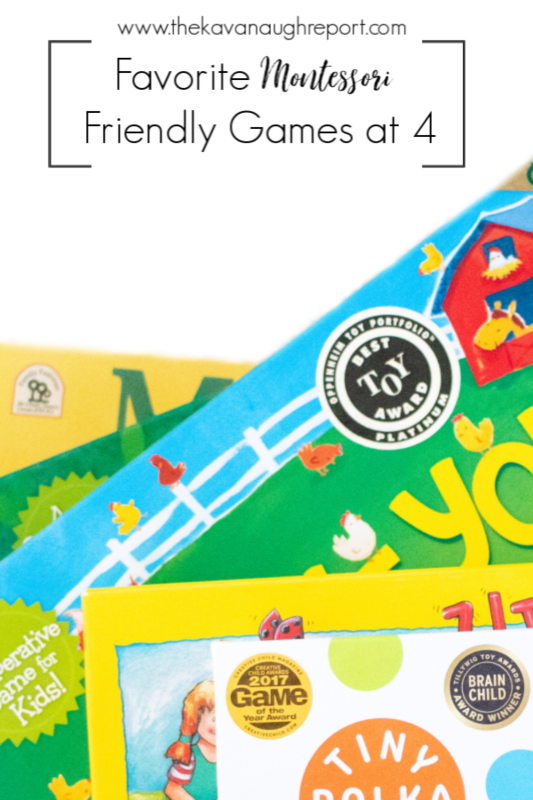 What types of games does your 4-year-old like to play? Thanks for these ideas! My 4 year old is obsessed with Outfoxed, which we got when I first saw it here. We also play a lot of Animal Upon Animal. I'm excited to round out our game cabinet with some more good options! Nora hasnt gotten into Outfoxed yet, but that is another fantastic game!